Case: Illinois Watch Case Co. Many believe theirs is the generation when excellence and intricacy was established; that, prior to their birth, mankind was incapable of articulation, mechanical or otherwise. How could anyone accomplish anything of quality without today's technological prowess? Others believe the rise of civilization must have begun with the advent of the automotive assembly line in the early 20th century; that Henry Ford must have founded the mass-production of intricate machinery. In fact, by the time Mr. Ford opened his first automotive assembly plant in 1903, Elgin National Watch Company had, since the Civil War, produced more than ten million precision instruments in the form of pocket watches. 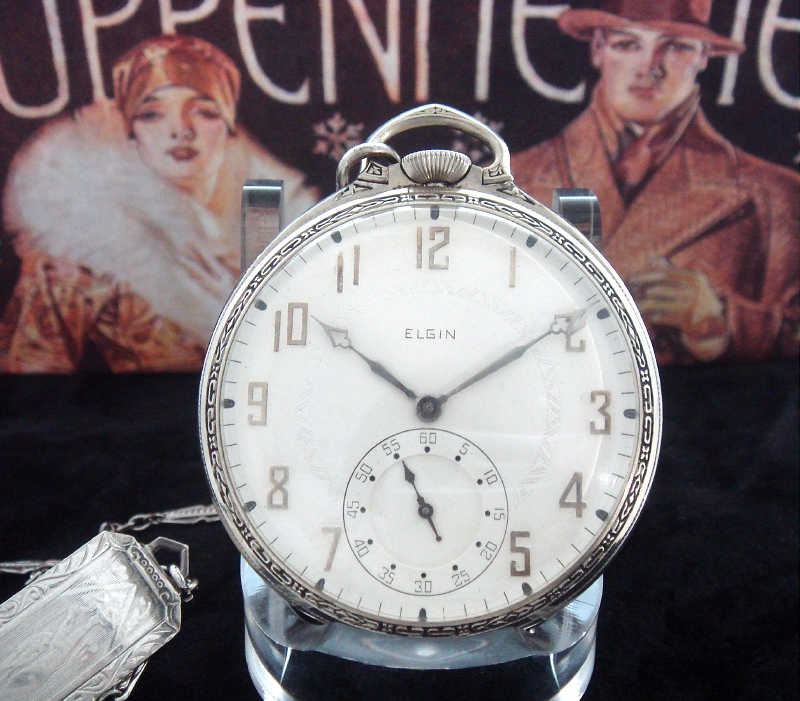 By the turn of the 20th century, Elgin National Watch Company, along with other American manufacturers such as Waltham, Howard, South Bend, Illinois and Hamilton were quite skilled at producing intricate timekeeping mechanisms, resistant to heat, position and metallurgical eccentricity – and riding to work on horseback to do so. This 14 size "Gentleman's" pocket watch, produced during the height of the Jazz Age, is an example of a very fine, intricate thing manufactured 86 years ago. It is the very age and quality of this watch, combined with the art of its overall design that make it such a work of tactile art. Measuring 45mm in diameter, it is white gold filled and enameled; crisp and elegant. Its 17 ruby jeweled mechanism is a thing of beauty in its own right, featuring damaskeened, solid nickel plates, compensated balance and micro-regulator. As most fine things, this work of tactile art has an aura of quality about it that perks up the senses of the ladies and gentlemen around it. We've cleaned, oiled and calibrated this timepiece so that it keeps time as intended. Offered in a fitted period presentation box, it comes with a matching chain adorned with a woman's figure – ready to be carried and worn by someone who identifies with the artful generations before him.